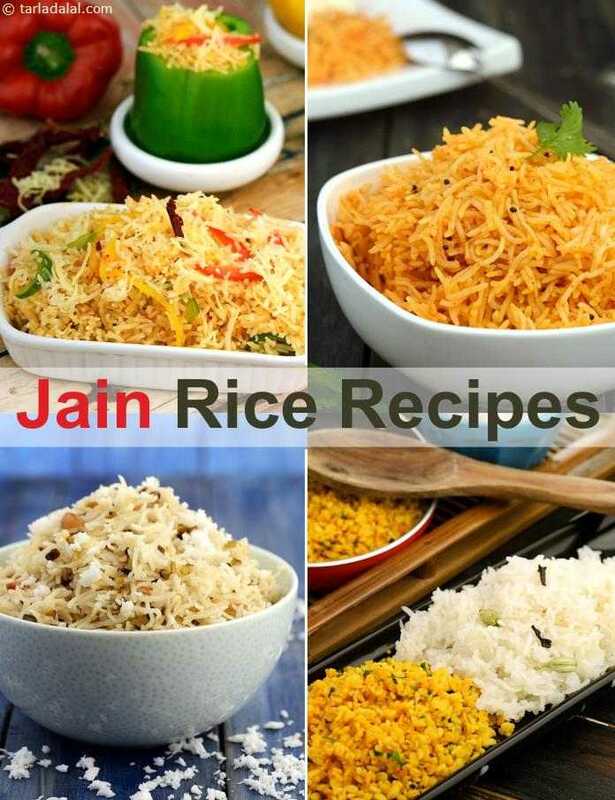 Rice recipes without onions, garlic, potatoes and other ingredients that are usually avoided by Jains, can also taste fabulous, when cooked with the appropriate ingredients and using smart cooking methods that elevate the flavour and aroma of the dish. Lose yourself in the mouth-watering taste of Jain Rice Recipes like Cheesy Pepper Rice and Vagharela Bhaat . Tangy rice dish, flavoured with peanuts and malagapadi, a south indian spice mixture. Rice and creamy coconut milk make a unique combination. This is a rajasthani delight. It goes well with dahi-ki-kadhi. Sprout kichdi is my innovative dish to serve my growing child. this recipe can be given to babies from their 10th month onwards. diet conscious and ailing adults can eat this since ukda chawal is easy to digest. no chillies are used so that it caters small children. This rice tastes great with any raita and is great fr lunch boxes too. Presenting a traditional way of preparing the most authentic Thayir saadam, a main course item enjoyed with pickle in Tamil households. The rice based thayir saadam has curd, grated mango and chopped cilantro as ingredients. A sweet and sour rice preparation made using left over rice. Mint and coriander are good coolants and this is very easy to prepare and goes well with any type of raita.